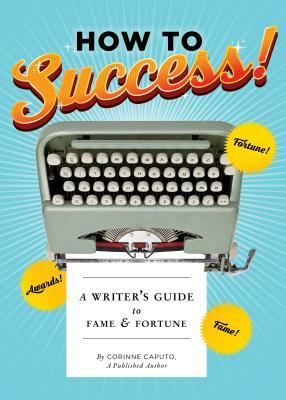 This parody self-help book for writers is filled with hilariously misguided tips, factual-looking charts, and other advice that knowingly pokes fun at writerly foibles while still cheering would-be authors on. With this book, struggling writers can find suggestions for effective paragraph shapes, tips on where to find inspiration (in your reflection, in the shapes of gum stuck to the ground, in a consultation with your doctor), thoughtful poses for author photos, pull-out procrastination excuses, and much more. How to Success! is filled with enough almost-helpful advice to keep aspiring writers amused, unblocked, and on their way to literary fame. Corinne Caputo is a writer and comedian who lives in New York City. This is her first book. She is, as a direct result, almost inconceivably famous and wealthy. "'How To Success!' lightens the pressure many creatives put on themselves to succeed. In effect, it acts as a mirror, showing readers how silly and elusive writing-and writers-can be. Caputo offers practical advice with a comedic twist that will have you laughing out loud."